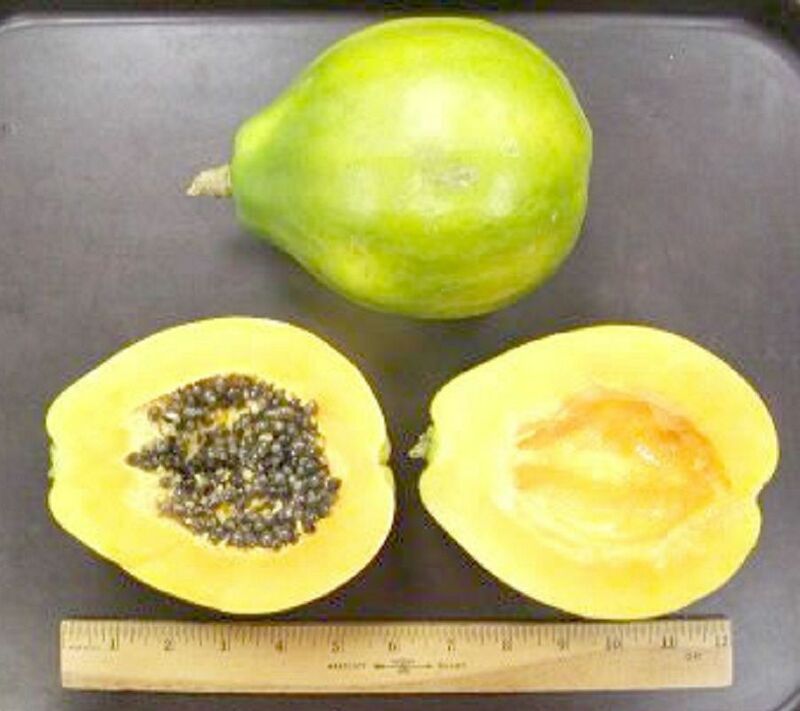 Waimanalo Low Bearing Papaya (X-77) is a yellow/orange fleshed solo papaya, low bearing to the ground initially. Larger than Sunrise weighing 22-32 ounces. Fruits set at an average of 30 inches above ground. Kamiya, Laie Gold, is a medium size variety sold in local Hawaii markets and is the most popular commercial papaya in Hawaii. The fruit is sweet and very delicious. Fruits are produced at about five or six months from planting when the plants are still small. Developed at the University of Hawaii for Tropical Plant Research, these cultivars are considered the best available anywhere. 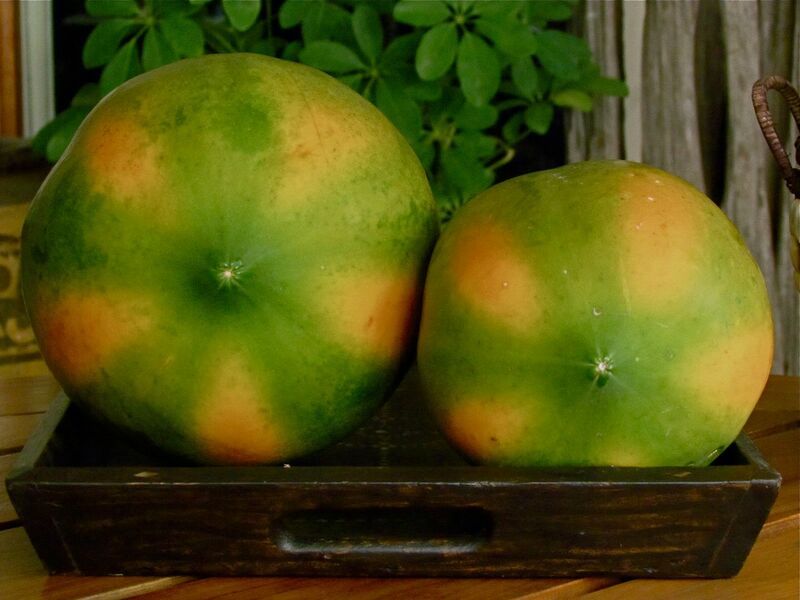 Grown only on Oahu, Kamiya is a rounder, larger fruit than the other varieties. Kamiya has a thin, greenish-yellow skin with thick orange flesh. It is ripe when it yields to finger pressure; do not depend on color of skin. It is grown for local market only. Laie Gold is the genetically engineered papaya of the Kamiya variety that is resistant to the ringspot virus disease. In Hawaii, all 'Solo' Papayas growing in Hawaii have a gene had been modified to enhance resistance against Papaya’s biggest enemy, the Ringspot Virus). Papaya plants produce flowers that are either male, female or hermaphrodite. 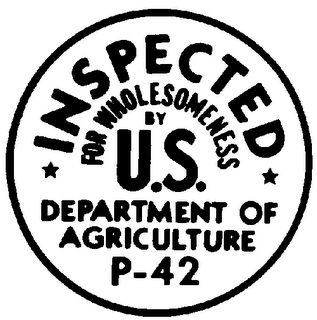 Male plants do not produce fruit. Female plants must be pollinated by either male or hermaphrodite flowers to produce fruit. Hermaphrodites are self fruiting and the most desirable kind. The Hawaiian Solo papaya produce seedlings that are either female or hermaphrodite but no males. 30% will be female and 60% will be hermaphrodite so you are always assured that you have a plant that can produce fruit. This is a very easy plant to grow whether in the ground in frost free areas or pot grown in cold winter climates. The taste of tree ripened papaya is so much better than what you find in the grocery store. Fruit round with a short neck, average weight 16 to 39 ounces. Skin smooth, and glossy, cavity star-shaped. Flesh thick, firm, orange-yellow in color, flavor and quality high, keeps well. Recommended for fresh market and processing. Fruits of female plants rough in appearance. Average height to the first flower is 32 inches. Fruit averaging 680 grams. 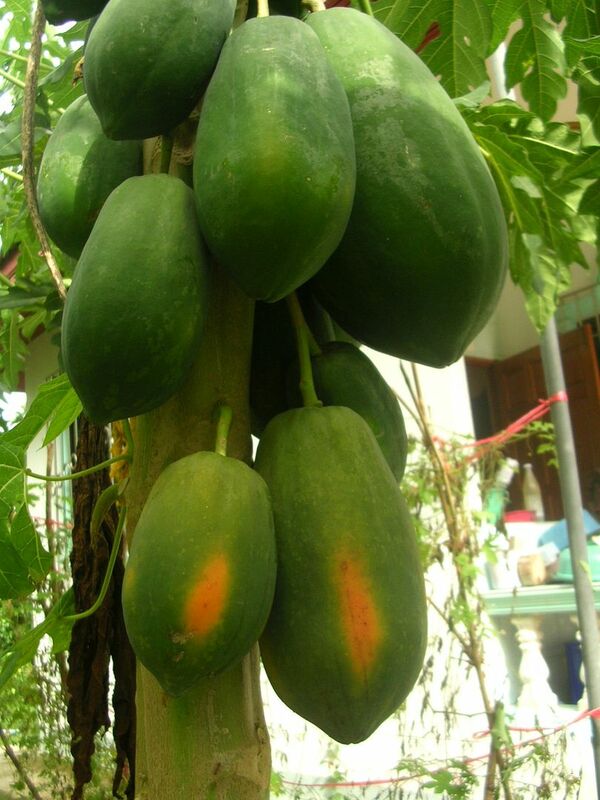 Sweet fruit and high yielding with a distinctive papaya flavor. Waimanalo has tolerance to some diseases and fungus. It performs well in high moisture areas. Seeds produce a gender ratio of 66% hermaphrodite and 33% female. Tropical papaya is a fruit that used to be relatively unknown outside of the tropics, but today you can find it just about any supermarket. Papaya fruit is loaded with nutrients so there is much to be gained if this fruit strikes your fancy. One serving has high fiber and potassium, iron, calcium, plus the daily requirement of vitamin A and three days worth of vitamin C. Papaya contains antioxidants which can protect from certain types of cancer, such as colon cancer, and is known to help with digestive problems. Papaya is eaten just like a melon. Shaped somewhat like a pear, papaya is very sweet but does not have a high sugar content. Green papayas contain the most papain, which is an enzyme that is used to tenderize meat and help with inflammation in the human body. 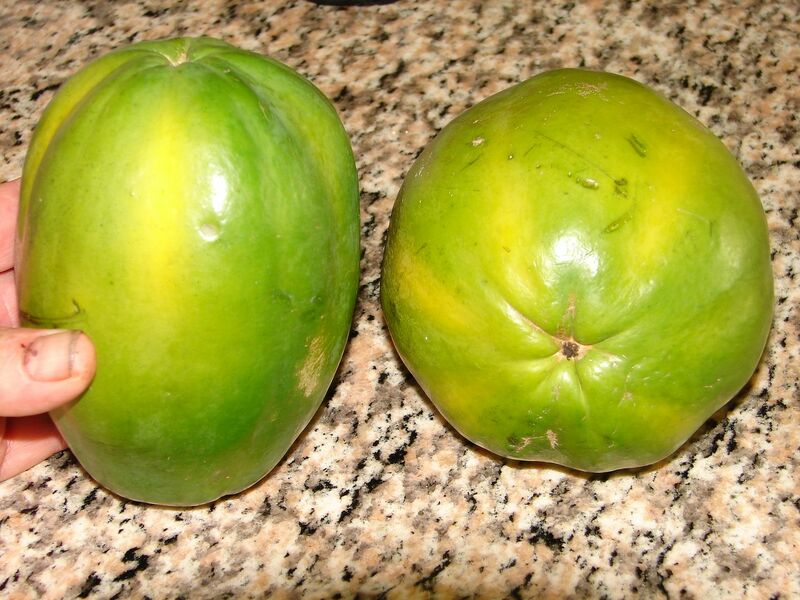 Papaya has bright yellow to green mottled skin. When ripe, the outside skin will be more of a golden color. Other types of papayas turn pink or orange inside when they are ripe. Christopher Columbus called papayas the “fruit of angels”. Some people say papaya tastes like an apricot sprinkled with ginger. The fruit is used in all types of recipes--meat marinades, salads, and is often added to other fruits in both smoothies and dried fruit and nut mixtures. Red papaya adds nutrients to whatever dish you make with it. High fiber helps to regulate and clean out your colon. All together it contains a whole group of vitamins, including A, C, E, B-9 and K.
In addition to vitamins, Papaya contains antioxidants, known as phytochemicals, which can protect the body from heart disease and certain forms of cancer. These antioxidants protect the body from toxins known as free radicals, which can attack cells. Papaya also contains a couple of enzymes which are good at digesting protein. These are chymopapain and papain. One of the benefits of these substances is that they can help reduce inflammation for people who have arthritis, osteoarthritis, or asthma. As each order is packed and prepared separately you will pay the quoted S/H charges individually per item. If you buy the same species in that item it does calculate out the discount (i.e. : additional item $7.61). My stores' combined shipping is built in for same items rather than a varied selection. 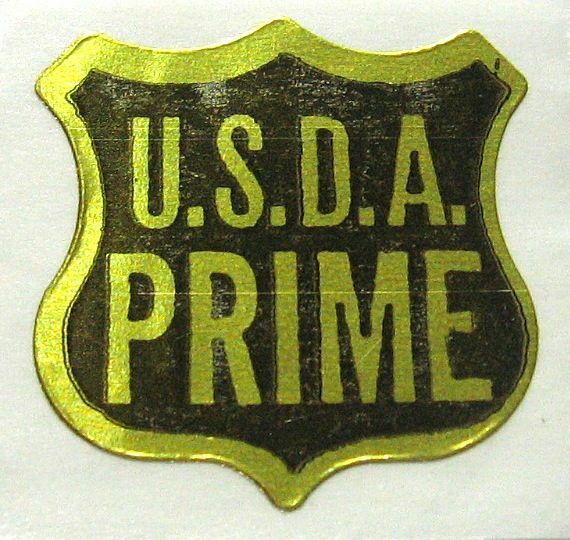 S/H includes postage, USDA certification and inspection, proper packing and delivery to Airport for prompt delivery. I can't really change any of these. 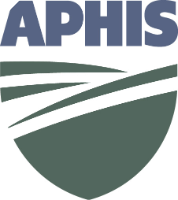 If you want one of this and one of that, it is hard to discount much as each different species requires it's own prep, packing, then at USDA each has to be unwrapped and inspected then repacked. USDA requires me to clean and prepare every last piece before we drive them to the Inspection Station on the other side of the island. It takes my wife and I, a day to pack items and get ready to ship. The whole next day we drive around the island and get inspected (2-3 hours), then drive to the Airport Post Office to drop off. It takes the same work with the same type item if you can understand. The expense to send it to you is most of your payment. To send any replacement(s), I try to piggy back with your next order.